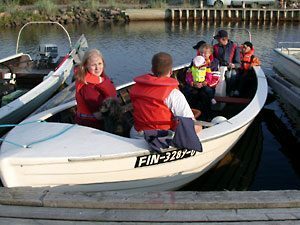 Fishing trips are arranged for groups and they include traditional sea fishing during both summer and winter. The trips are fit for the groups of 2-7 people, and the routine can be altered to correspond the needs of the group. The leader of the trip has sea fishing experience of 25 years. – Done with either fishing net or fyke. – The trip starts from the Sunikari fishing harbor. – The group drives to the net buoy or fyke with a boat. – The visitors are allowed to take part in doing of the nets. – The group drives to the ice holes with a snow mobile. – The visitors are allowed to take part in doing of the nets at ice holes. After the fishing, the group will get back to shore with a catch, and they will enjoy some delicious fish foods and coffee. Call us, and we’ll arrange the fishing trip fit for Your needs! – The trip includes the setting and lifting of the nets, along with a possible catch. – Trip will last for about 3 h.
– The life jackets for adults and coffee at the sea are included in the price. The price in addition of cottage rent 155 €.